This was the scene in the Tropicana Showroom Theater in Atlantic City last night after the day’s Smash Bros. Melee matches had wrapped up as some of the game’s beloved pros tried to resurrect a decades old rivalry between East and West coast players. 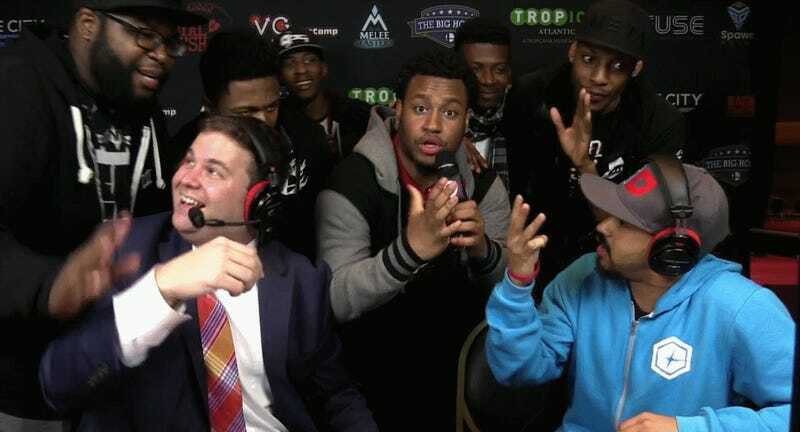 In the middle was Ryan “The Moon” Coker-Welch, a top-ranked player from New York City who decided to poke fun at commentator Phil DeBerry after coming off a close 3-2 series against Northern California’s Johnny “Smoke2Jointz” Kim in the last bout of the night. From there, the discussion moved on to one of the day’s more interesting East/West match-ups, Alex “Smuckers” Cottrell vs. MikeHaze. 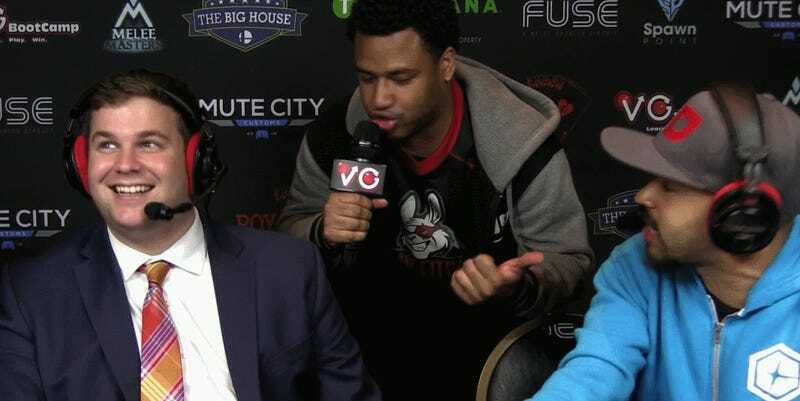 For a moment, it looked like Smuckers was about to knock Haze down into the loser’s bracket, with the crowd exploding after one particularly heinous combo in which the latter, playing as Captain Falcon, drove the former’s Fox off stage with a five-hit sequence ending in the racer’s iconic electric knee cap. Ultimately, Haze went on to take the series 3-2 after cleanly knocking one and a half lives back off his opponent, but since the tournament is taking place in New Jersey, the predominately East coast crowd was understandably unimpressed. In the most recent crew battle between both coasts, wherein teams of seven players each hailing from each region compete in a relay-style marathon battle to see which has the best players and the deepest bench (a match-up that arguably favors California at the moment). Rivalries and regional identity provide the backbone to a lot of professional sports. For decades, die-hard fans of the Oakland Raiders painted themselves black and white and howled for their team, week in and week out, completely detached from scorelines and season records. Most esports are different, however. With games played online and teams consisting of talent from wherever it can be found, rooted less in geography than ephemeral team logos and the memes that haunt Twitch chats and sub-reddits, fans flock to the high performing and charismatic with loyalty remaining fluid. 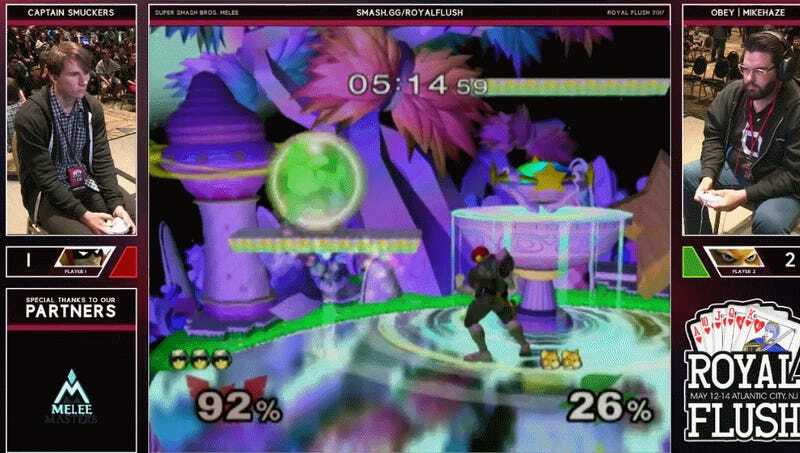 But some competitive gaming scenes, like Smash Bros. Melee, are different. The cumulative result of years of grassroots organizing, with players meeting in local shops and regional hotels, is a community where hometowns matter. Naturally then, California and New York arose as mastheads under which the regional talent could identify with one another. With small prize pools and the expenses of cross-country flights, a burgeoning rivalry between the East and West coasts was almost inevitable. While some of the feuding has died down as Melee has aged, the scene has become more professionalized, and top players travel on a monthly basis to participate in the biggest events, it’s become an important organizing narrative for fans. As a result, players and analysts have taken it upon themselves to breath new life into the old East vs. West Smash beefs. In the Royal Flush’s conclusion today, Moon will have to overcome another West coast rival in the loser’s semifinals DaJuan “Shroomed” McDaniel, or else make his meandering trash talk look even more silly, while on the winner’s side, West coast favorite Joseph “Mang0" Marquez and East coast favorite Juan “Hungrybox” Debiedma sit on either side of a Swedish wall manned by William “Leffen” Hjelte and Adam “Armada” Lindgren (coincidentally, both Leffen and Armada hail from opposite coasts back home as well). But regardless of who ultimately makes it to the grand finals, each showdown will offer another data point in the Smash community’s ongoing feud. You can watch the rest of the tournament in the stream embedded below.